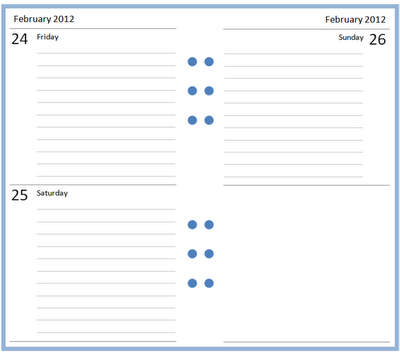 As promised, today we're making available the Personal size 2012 diary sets. 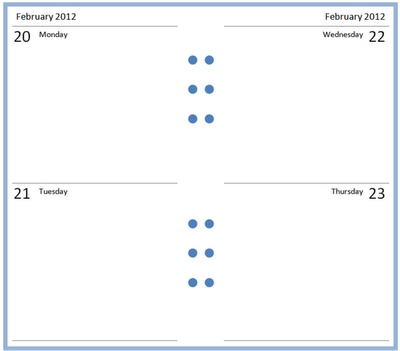 These are layouts each covering the whole of 2012, but this time for the Filofax Personal. They are created as A4 documents with each A4 sheet yielding 2 double-sided pages. Print the sets double-sided. If you have a duplex printer, set it to flip on the short edge. If you don't then you'll have to print odd-numbered pages and then refeed to print the even-numbered pages on the reverse. You might have to experiment to find out how to refeed the paper. 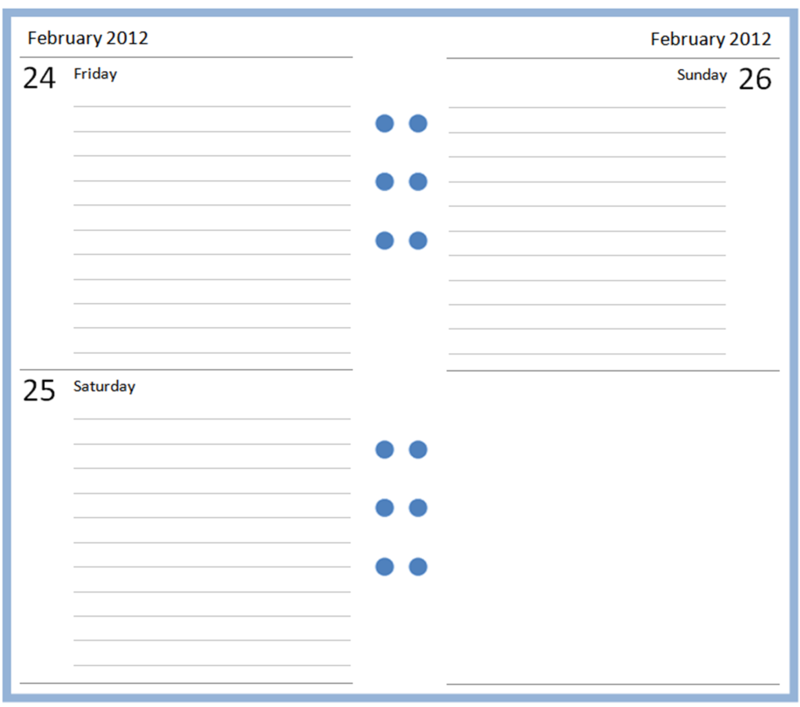 Based on the first of our new A5 layouts, we've made certain compromises to get this onto Personal size pages. 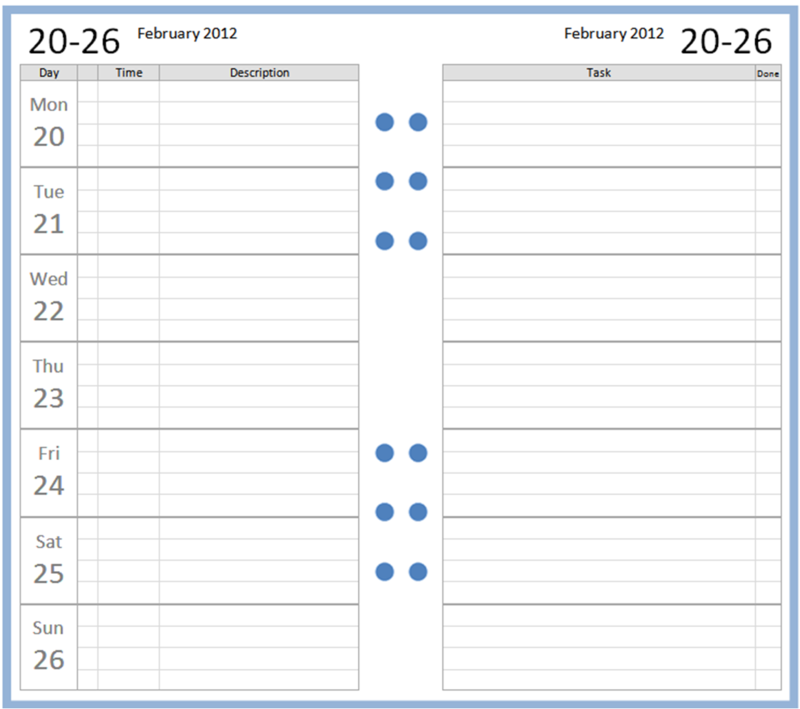 There is no room for the mini-calendars, nor for the communications and coming up sections. But we're really pleased with the result. This one is a very straightforward implementation of our 2DPP A5 layout. Again, we've just adapted our 2DPP A5 layout. It's the same as no 2, but with lines. This one is a bit of fun, and results from a special request. 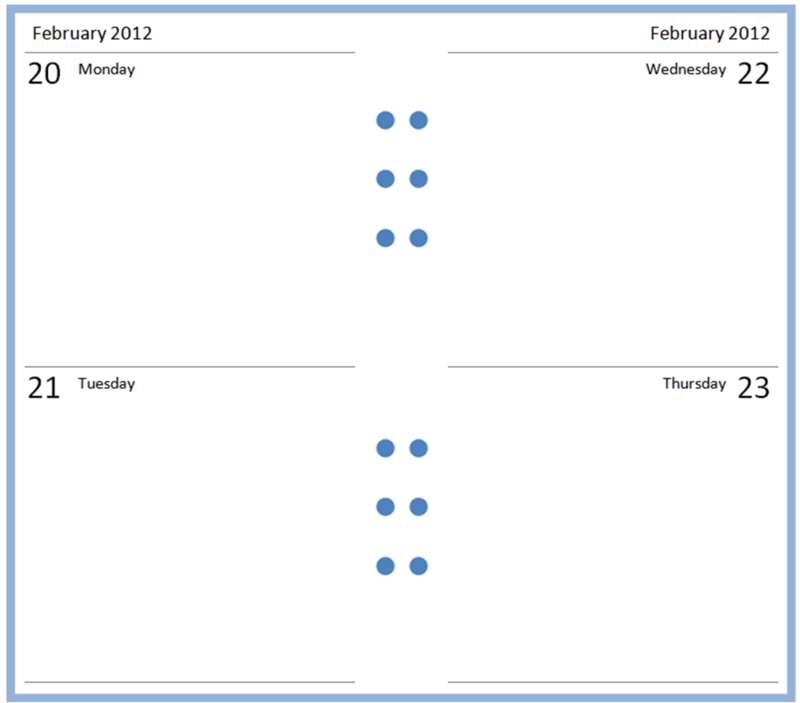 Based on the lined version, each day has a vertical strip of icons. As well as a set of weather icons (sun, cloud, rain, wind, snow) which you can use to record the prevailing weather each day, there's also a little face for you to draw in a mouth line representing your mood - a smile, a frown, a wide 'O' of surprise, perhaps even a little teardrop. We're not done yet with Personal layouts. Steve is working on a week per page layout and we also want to produce versions that can be printed straight onto Filofax Personal paper, plus undated versions. Of course, I'll also make the source files available so that fellow bearers of the Geek gene can tinker. I was going to ask if there were any plans for a personal dpp template, but then I saw the post listed on the "you may also like" feature. Somehow I missed that original post (for shame!). I'm going to give it a whirl. You're welcome. 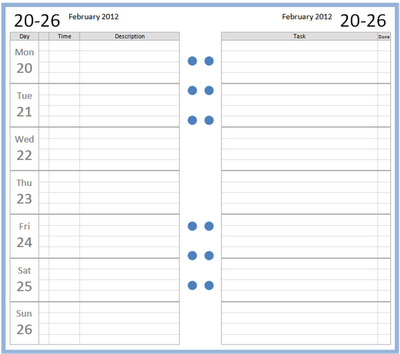 The Personal DPP is for printing on Filofax Personal paper. At some point I'll make a version you can print on A4 and cut down. Ah, okay. That's the one I'll wait for then, as I don't have the Filofax paper. Could you please let me know the source of the weather icons? But the circles around them are just Word AutoShapes.